Things are pretty busy here in the "winter sports capital of the world." That was a tag line the Olympic Regional Development Authority came up with a few years ago. I haven't noticed them using it recently, but it was a nice hyperbole. To be fair, I could go along with the "winter sports capital of the world" concept if I could empirically qualify the statement via a study to see if we do indeed host more events and have more venues than anywhere else in the world, but that seems like too much effort to make a point. This past week has been the busiest I've seen in a long time here in the Olympic Village of Lake Placid. There is so much going on that I am already a little exhausted. For example, the skiing is absolutely fantastic. Mount Van Hoevenberg is in incredible shape; I had one of the fastest and most fun skis there the other day. Whiteface Mountain is also rocking. About 1,400 athletes participated in opening ceremonies last night at the Olympic Center's 1980 Rink to kick off the 2008 Empire State Games. The Village of Lake Placid is packed with Presidents Week visitors checking out the food and boutique shopping. Action is picking up at the Prudential Terry Horrocks Real Estate Office where I am an agent. I've had a number of people looking for second home and investment property. The most important and fun event of the weekend, however, is sure to be the Full Moon Party this evening at Cascade Ski Touring Center. Johnny and the crew will be playing inside and the threatening and intimidating bouncer, SSS, will be on the door. Be forewarned, if you are coming to the Full Moon Party, bring your dancing shoes AND your I.D.! 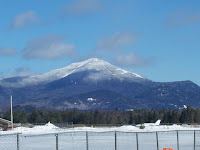 Today's picture is a view of Whiteface Mountain taken from the Horse Show Grounds and Town of North Elba playing fields. I was always marveling at the views during my son's soccer and baseball games!